Evita, which initially debuted on the West End in 1976, is currently in the midst of its second UK revival, after many incarnations around the world to varying levels of success. 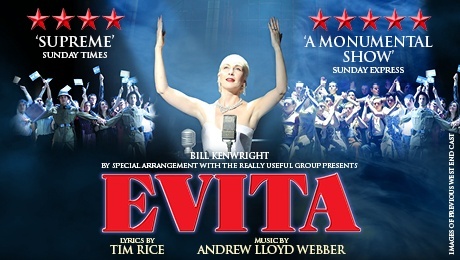 As part of its current tour, Evita has rolled into the Liverpool Empire Theatre, and a sell-out crowd was on hand for the premiere performance. Based on the life of Eva Duarte/Perón (played by Emma Hatton), a famous Argentinean actress who would become a political leader after marrying Argentine president Juan Perón (Kevin Stephen-Jones). As with Blood Brothers, the show opens by focusing on the eventual outcome (I won't spoil it here), before we travel back in time to Eva Duarte falling in love with a tango singer named Agustin Magaldi (Oscar Balmasada). As their relationship blossoms, her popularity rises as they move to Buenos Aires, only for Eva to leave Magaldi as she looks to soak up the benefits of her increasing fame as she becomes a model, then a radio star and later an actress. Along the way, after performing at a charity concert in the aftermath of an earthquake in San Juan, she meets Colonel Juan Domingo Perón, and later marries him, which upon his appointment as President of Argentina, sees her become the First Lady of the country. Her ego grows as her new role sees her become even more famous, but a cruel twist of fate changes things forever and ultimately leads to the aforementioned conclusion. Almost all of this is told through song and through the physical performances; aside from the music, there is almost no dialogue. Indeed, unlike many musicals, the story is close to being told entirely through such songs as On This Night Of A Thousand Stars, The Art Of The Possible and, most famously, Don't Cry For Me Argentina. The singing performances are strong across the board, and although the dialogue beyond the music is very limited as I have pointed out, the use of visual techniques and stage directions to convey emotion and tell a story ensure that the acting is also of a high standard. Unsurprisingly, the star of the show is Emma Hatton as Evita, who steps into the shoes of the former Argentinian icon effortlessly, to the point where you truly believe that you are watching Evita, as opposed to someone playing the role of Evita. In addition, I felt that Oscar Balmasada did a fantastic job as Magaldi, since his role ultimately becomes secondary after initially being a key character, but he nevertheless does more than anybody to explain what is happening and to move the story along. On that subject: the biggest negative I would have about the show is that it takes a long time to understand the plot. Obviously, the beginning of the show providing a hint of the final scene is a big hint, and it's clear that the show is discussing the life of Evita, but the twists and turns relating to her life, at least prior to meeting Colonel Perón, are difficult to tie together. Watching the show, I got the impression that if you didn't know anything about Evita's life or the show beforehand, it would take a very long time to truly understand the story being told. The music-only format may also put some people off; it is very similar to opera, of course, but no extended dialogue between scenes to provide a breather, so to speak, coupled with the potentially confusing storytelling in the first half, could mean that a lot of attendees will only begin to truly immerse themselves into the show once it reaches the latter stages. As a production, though, it is definitely a strong entry into the Empire canon, assisted by some simple yet stunning settings, including large paintings of Evita from down the years. The use of props is a nice touch as well; there's nothing that will wow the audience from a prop standpoint, but certain items that are used add more depth and realism to scenes, and help to bring you into Buenos Aires circa the 1940s. To conclude, Evita is one of those shows which nobody would deny belongs within the upper echelon of theatre productions, but a number of factors mean that it may not be something that appeals to everyone, based on entertainment and what your personal tastes are rather than any questionable content. If you match up with the preferred target audience for Evita, though, chances are that you'll find this to be a thoroughly enjoyable and well-performed incarnation of one of the most famous theatre shows around.